Fox News host Tucker Carlson on Monday called out the media for pushing for war in Syria and said no one actually knows who carried out the alleged gas attack in Douma, despite claims to the contrary. 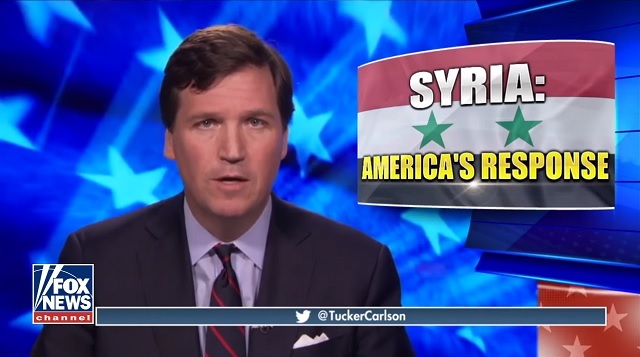 "Leaders on both sides of the aisle in Congress, in the media, in our intelligence services and virtually every overfunded think-tank in Washington have suddenly aligned tonight on a single point of agreement: America must go to war in Syria immediately," Tucker said. "Bashar al-Assad cannot continue to lead that country. He must be overthrown." "Assad is an evil man they tell us," he said. "Assad's poison gas suffocated children. Pictures of the aftermath of that are all over the internet and they are horrifying. Assad is a monster. That's the official story — almost everyone in power claims to believe it." "All the geniuses tell us that Assad killed those children. But do they really know that? Of course, they don’t really know that, they're making it up. They have no real idea what happened. Actually, both sides in the Syrian Civil War possess chemical weapons. How would it benefit Assad, from using chlorine gas last weekend?" "With Assad gone, who would run it exactly? Do we have another strongman in place to install? Or is it our hope that a stable democracy will magically appear in the wake of this protracted civil war?" Carlson went on to say calls for an immediate response to the attack amount to "foreign policy by viral video." This is the most unvarnished truth I've ever seen spoken on television in my entire life. Tucker is risking his career by speaking out on this fraud and he's already getting viciously attacked by the lying media hacks at Mediaite and Media Matters. Equally remarkable was his follow-up interview with Mississippi Republican Sen. Roger Wicker. Tucker opened by asking Senator Wicker, "what is the American national security interest that would be served by regime change in Syria?" Wicker responded stammering, "Well, uh, if you care about Israel, your, your, uh, you have to be interested at least, in what's going on in Syria. Uh, we're fighting ISIS there, uh, Iran is seeking to dominate the whole, uh, region, uh, I think we have nation interests in, uh, in Syria." He then pivoted to explain Trump probably has secret information the rest of us are not privy to proving Assad was behind the last gas attack which General Mattis admitted the US has no proof of just two months ago. Tucker then went on to interview Theo Padnos, who was taken hostage for two years by the rebel terrorist group al-Nusra in Syria. Padnos said without question the Syrian rebels would carry out such an attack and they have the chemical weapons to do so. "I have been in conversation with these people, I mean, I lived with them for two years," Padnos said. "I know what their goals are in life." "They are interested in carrying out an extermination, a war of extermination against their enemies, particularly the Alawite but really against the Syrian government," Padnos continued. "And you know they're more than willing to use any weapon whatsoever, anything it takes to rid themselves of their enemies. I'm quite persuaded that their goal is total annihilation of the enemy and and they think that chemical weapons will do the trick and they talked to me about, you know, these ambitions of theirs is to exterminate the enemy. I have no doubt that this is, you know, something that they desire. It's their dream, they believe that they own this land, that God gave it to them and that they should kick the other people out kill them."